I love Christmas lights – although probably not to the extent of the Gay family in New York who in 2014 had a display of 601736 lights, which involved about 40 miles of cable. One wonders what happens when they get tangled. My Christmas lights always get knotted up. So I was delighted to discover that this year Tescos have employed a Christmas light untangler. 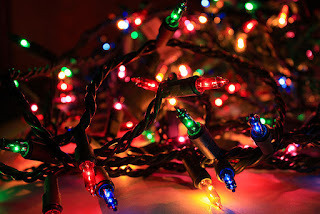 The job advert said that the person appointed would be able to ‘successfully untangle customers’ Christmas lights neatly, quickly and efficiently and in an orderly fashion.’ Specifically, they must be able to untangle three metres of Christmas lights in under three minutes. Whilst that is great news for me, there is a bit of problem. To make use of the Christmas light untangler I would have to go to the store in Wrexham. Christmas lights are special. There is something very poignant about walking in dark streets that are lit with Christmas lights. Christmas is noisy. Parties. Music. And there are umpteen carol services and concerts. Christmas may be a busy time of year for vicars, but compared to music teachers and directors of choirs, it is a doddle. And that is right. Because Christmas is a celebration. Heavenly angelic choirs, sing: ‘Glory to God in the highest, and peace to his people on earth’ And earth joins in with the chorus: ‘O come let us adore him’. But there is another response – and it is this which I wish to speak about today. It is the response of silence. The prophet Zechariah declared, ‘Be silent, all people, before the Lord; for he has roused himself from his holy dwelling’. This is not the silence of absence. It is not the silence of the dead; the silence which mocks our dreams and our love. The silence that will fall on our universe in multi billions of years – like a heavy damp blanket that will smother everything that is and turn it into what is not. Of all the mosaics in St Apollinare Nuovo, Ravenna, this is the one that got to me the most. It shows a woman fully covered at the foot of a man. Apart from the man in blue, none of the other figures are paying her any attention. Indeed one seems to be saying, with the gesture of his hand, ‘walk on by’. 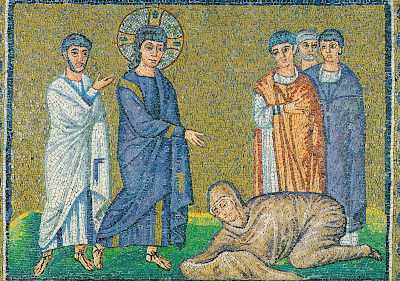 The man in blue (no prizes for realising it is Jesus – the halo is a bit of a give-away) is, however, bending toward her and appears to be reaching out his hand to her. When we lived in St Petersburg, Prince Charles came to the city. I don’t think it was because we were there! There was a reception for British citizens who lived in the city, and we were invited. We were placed in small groups and told how to address his Royal Highness. He approached our group, saw my dog collar, found out that we worked in the Orthodox theological college and said how impressed he was with the way that they involved children in their services. Actually, that was not an area we would have considered a strength, but all I managed was a tongue-tied 'yes sir'. 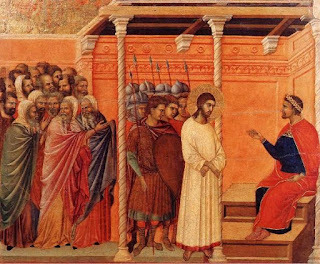 Jesus was standing in front of the most powerful man in Judea – and it wasn't for a social gathering. He was on trial and the probability was that he would be sentenced to death. If anybody should have been tongue tied or over-awed it was Jesus. The whole weight of the establishment was directed against him. 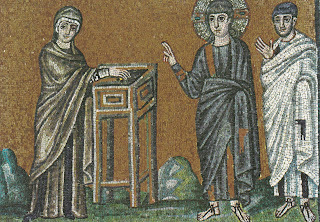 This is the fourth picture that can be found on the walls of the church of St Apollinare Nuovo, Ravenna. 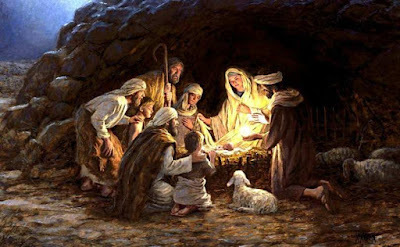 It is a portrayal of the incident recorded in Mark 12.41-44. So there is the chest, the widow, Jesus and a disciple. I came across a new interpretation of this passage. In the previous verses we have been warned about the teachers of the law: ‘They like to devour widow’s houses’ (v40). And now we read of a widow who has to put everything that she has into the temple collection box. Jesus' is challenging a religious system which exploits the poor. While I think that we need to hear that challenge, I am not convinced that this is what is going on here. The widow’s giving appears to be completely voluntary. And Jesus points to her as an example of giving. 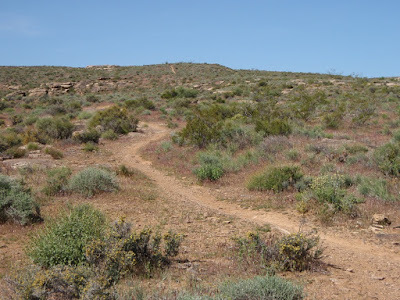 My own view is that Jesus is teaching us here what it means to follow him, about discipleship.